Ask a child to draw you an elephant and pink is probably not the color they will go for. 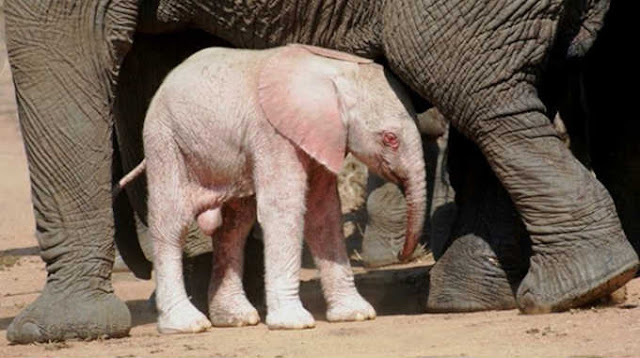 However, tourists in Africa recently spotted just that – a pink baby elephant that appears to be an albino was seen walking alongside its mom with a milky pink skin rather than more common grey. Albinism is extremely rare in African Elephants, so rare in fact that Nicki Coertze who took these amazing photos said that in 30 years she’s been visiting Kruger National Park this is the first time she’s seen one. Pink or grey or any other color, baby elephants are incredible.